If you are a fan of gluten-free toothpaste, deodorant and lip balm, or if you would like to make the switch to more natural personal care products, you’re not alone. Many people find that personal care products with harsh ingredients irritate their skin and some people with celiac disease find the gluten causes an adverse reaction. At the present time, a significant study has not been conducted on the effects of topical or airborne exposure to gluten. However, a sizable amount of people with celiac disease, gluten intolerance and non-celiac gluten sensitivity have reported skin reactions when using products containing gluten. For more information on this, click here. 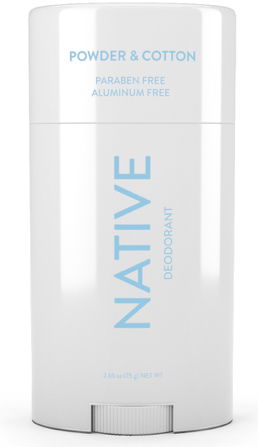 Native deodorant, body wash and bar soap are free from aluminum, parabens and sulfates. The products are formulated to keep consumers feeling and smelling fresh, with natural ingredients like coconut oil, shea butter and tapioca starch. The deodorant is cruelty free and comes in plenty of wonderful scents (we’re partial to Blackberry & Green Tea). Shop here. 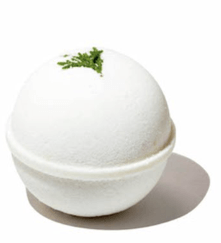 The CBD & Honey bath bomb for men is free of harsh chemicals, synthetic fragrance, foaming agents or colorants. It has a soothing aroma of a pine and cedar forest, is an excellent muscle relaxer and contains 200mg of CBD. Shop here. 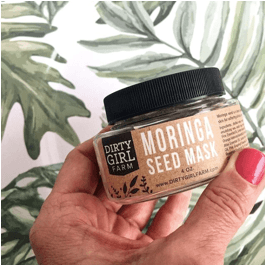 Dirty Girl Farm is a line of all-natural skincare products and holistic apothecary. All products are free from chemicals, toxins and gluten and are not tested on animals. The items are vegan and organic, smell amazing and leave skin feeling soft and fresh. Our personal favorites are the Rose Quartz Body Wash and Moth Bean Retinol Lotion. Shop here. This hand soap has it all: natural, non-toxic, hypoallergenic, vegan, gluten-free, biodegradable and made in the USA. It’s formulated to moisturize, soften and balance all skin types, leaving hands feeling amazing. Since the ingredients are so good for you, you won’t have to worry about cross contamination, so put these all over your home. Shop here. This toothpaste uses natural ingredients to freshen breath and whiten teeth, including activated charcoal, organic coconut oil and baking soda. It’s vegan, fluoride free, peroxide free, gluten free and safe for kids. The Pacific Mint flavor is refreshing and naturally flavored with xylitol and peppermint oil. Shop here. The cutest lip balm packaging comes from eos, bringing a product that is enriched with jojoba oil, shea butter, Vitamin E and SPF 15. It’s fun to apply and keeps lips soft and smooth all day. Finding a trustworthy gluten-free lip balm is crucial since it’s one of those products you’re most likely to ingest accidentally. Shop here. Everyone lotion does it all, with a three-in-one product that can be applied to face, hands and body. It’s gentle, cruelty free, paraben free, gluten free and uses ingredients that are natural and organic. The non-greasy formula is available in a wide range of fragrances and this lotion is sure to mend cracked. broken skin without breaking the bank. Shop here. Herbal Essences offers a line of gluten-free hair care products that aren’t harsh on hair or the scalp. Ingredients like aloe and sea kelp leave hair moisturized, soft and shiny. The line is also color-safe, pH balanced with no parabens, glutens or colorants. Shop here. If it’s safe for pregnant women, you can be pretty sure it’s a good-for-you product. This nail polish, available in a wide variety of shades, is vegan and gluten free, cruelty free and long lasting. The polishes are formulated to be safe for pregnant women, allergy sufferers, cancer patients and kids. The polish does not contain toluene, formaldehyde, formaldehyde resin, dibutyl phthalate (DBP) or camphor. Shop here. This shaving cream works for all skin types, whether sensitive, acne prone or dry. It is professional quality, ultra-lubricating and full of natural ingredients like aloe vera, sage oil, olive oil and sea buckthorn oil. The vegan, gluten-free product smells great and will leave skin feeling soft, smooth and nick-free. Shop here.